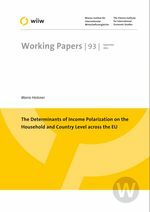 A multi-level approach to test for the determinants of income polarization both at the household as well as the country level is applied to a panel of about 300,000 households in EU countries over the period of 2003-2009. Among the policy relevant macro variables, higher progressive labour taxation and to a certain extent capital taxation is positively correlated with lower levels of income polarization. Also public expenditures on social protection, education and economic subsidies are related to a lower degree of polarization. Finally, lower unemployment, a stronger industrial base and more trade openness are also associated with lower levels of polarization.